Dedicated to providing a complete, integrated electric powertrain solution for commercial vehicles, AxleTech has entered into a strategic agreement with Agility Fuel Solutions, a global provider of clean fuel solutions for medium- and heavy-duty commercial vehicles. The parties will combine their respective processes and technologies to deliver highly refined vehicle controls systems for the most advanced electric vehicle (EV) powertrain developed. “The desire for electric powertrain solutions is growing rapidly in the commercial vehicle market, and AxleTech is ready to lead the way. Agility brings extensive experience to the table with their knowledge of integrating systems into trucks, their controls experience for commercial trucks, and their approach to battery packaging for the commercial vehicle market. 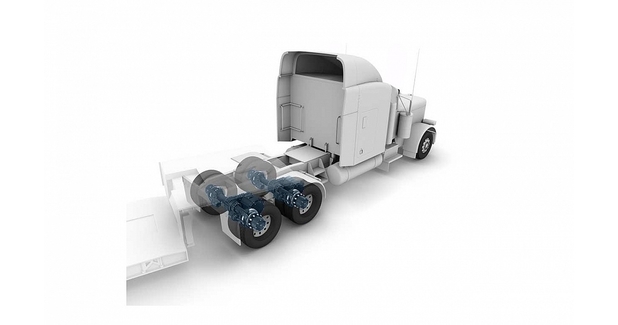 Strategic alliances like this one are what enables us to offer a complete integrated electric powertrain solution for medium- and heavy-duty trucks,” said Bill Gryzenia, CEO, AxleTech. As part of this strategic alliance, Agility will contribute high-voltage, liquid-cooled, lithium-ion battery packs specifically engineered for the intensive demands of CV applications. Modular in design, these batteries are the lightest and most compact liquid-cooled battery packs available for medium- and heavy-duty trucks. Complementing some of AxleTech’s electric powertrain solutions that fit within current chassis, suspension and wheel end envelopes, Agility batteries are configurable to chassis requirements and contain external interface points designed to ease installation and service. The collaboration also supports AxleTech’s power-source agnostic approach thanks to Agility’s experience working with a variety of transportation fuels including battery electric energy storage and delivery systems. AxleTech plans to introduce several EV product breakthroughs in April, including an off-highway electric axle at BAUMA, April 8-14 in Munich, Germany. It will also introduce one of the most efficient electric powertrains in the world for Class 6 through 8 trucks, as well as the most compact and powerful electric powertrain system for low-floor bus applications at the ACT Expo, April 23-26 in Long Beach, California. It will also partner on a demo electric tactical wheeled vehicle at the IDEF show, April 30-May 3 in Istanbul, Turkey.